The fact that you did this in MSPaint, with a mouse and keyboard is impressive. Completely original too. 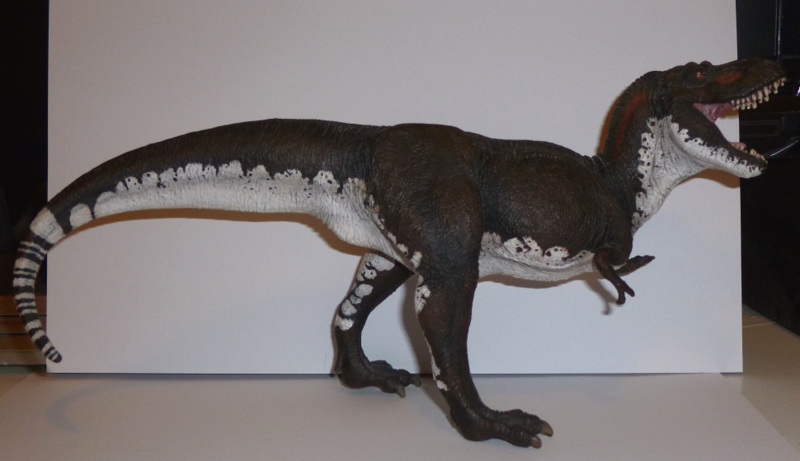 Working on a Figma-style 1/12-ish scale Velociraptor figure for Shapeways. Still very WIP, and the final product will come in both feathered and non-feathered variants for those who aren't fans of feathered dinos. Update on the 1/12 velociraptor. All that remains of the basic design are the hands, lower jaw, and thighs. I'll scatter some pebbly scutes on parts of the body for a basic scaly look as a separate figure, and then add wings and feather-textures for the feathered version. And to please as many as I can, the feather version will come with both scaly hands and 'feather-mittens' to swap as you like. Is it just me or should I remove a section of the neck to shorten it a tad? And here's Velociraptor 1.0! It's being printed at Shapeways as I post this and I should be getting it before the new year to test out. The hands are actually the first set of hands I've ever made in SolidWorks, so pardon their anatomical inaccuracies. The ball-socket joints used for the majority of the figure are approx. 5mm in diameter when assembled and my recent batch of them work pretty well for display purposes (I managed to chop and drill a Kenner JP raptor's arm and wrist up and fitted it with the joints and they worked out great). The neck seems...long? Maybe I need to take out a section to shorten it, reminds me too much of Coelophysis with that length. The inner claws on the feet will be sort of a snap-on assembling with a simple pivoting. The foot-claws are ball-sockets similar to the regular joints allowing a good range of motion for running and other poses. The lower chest has a peg hole for a stand I intend to design for it for doing dynamic poses, kinda like Bandai and Good Smile Company stands for their figures. Size-wise this will be just a bit bigger than a JP Coelohysis, smaller than a Safari Velociraptor (the non-feathered brownish-orange one from a few years back). 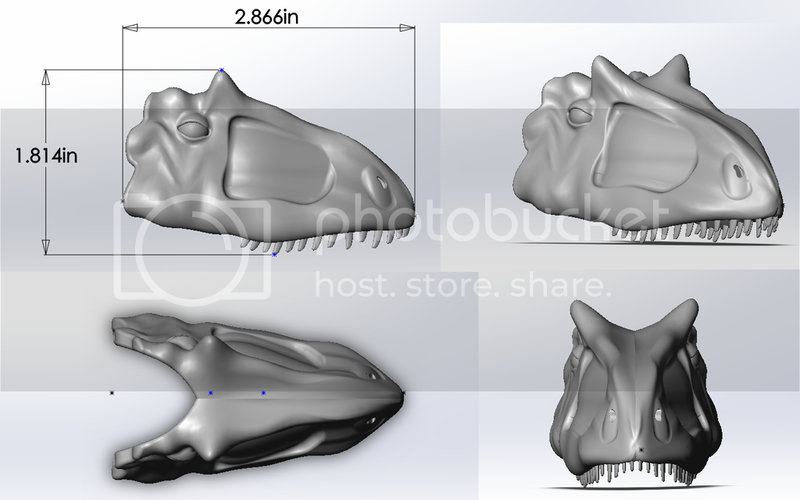 Rough, but here's a WIP 1/12 Allosaurus head based on a 28ft long specimen. A mini-update for Al here. Raised the ridges of his crests further down the snout, narrowed his maxilla more, and rearranged the teeth a little. I'm pretty happy with the upper jaws, next will be his lower set. 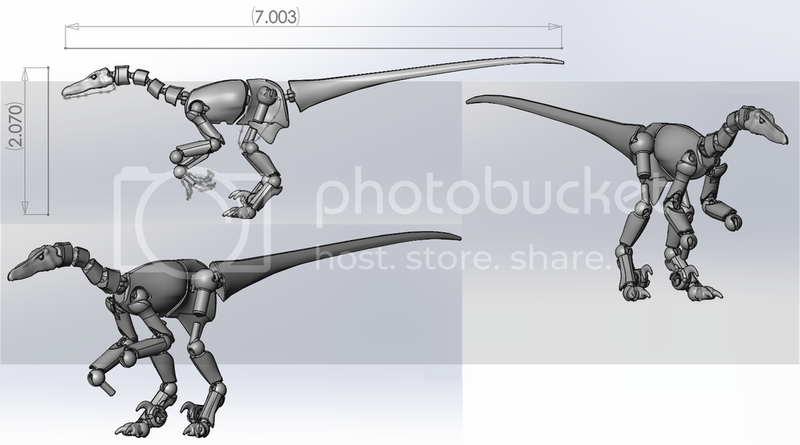 It turns out I forgot to scale this up on Shapeways, and thus it's a 1:12 of a 28ft specimen. Still, it'll be bigger than a Thrasher T-Rex once finished. Really neat projects! The allosaurus looks good. It's so fun to get things from shapeways made in a digital file to real life in your hand. "Happiness is physically holding your CAD file." Early stages of an Andrewsarchus head. Kinda going for a mix of the outdated look (Mesonychid) and a more Enteledontid look, hence the broad entelodont-like snout combined with nostrils often depicted on mesonyx and modern carnivorans. Might need to taper the tip of the snout though, the goal is to have the lower jaw's teeth fit within the lips. 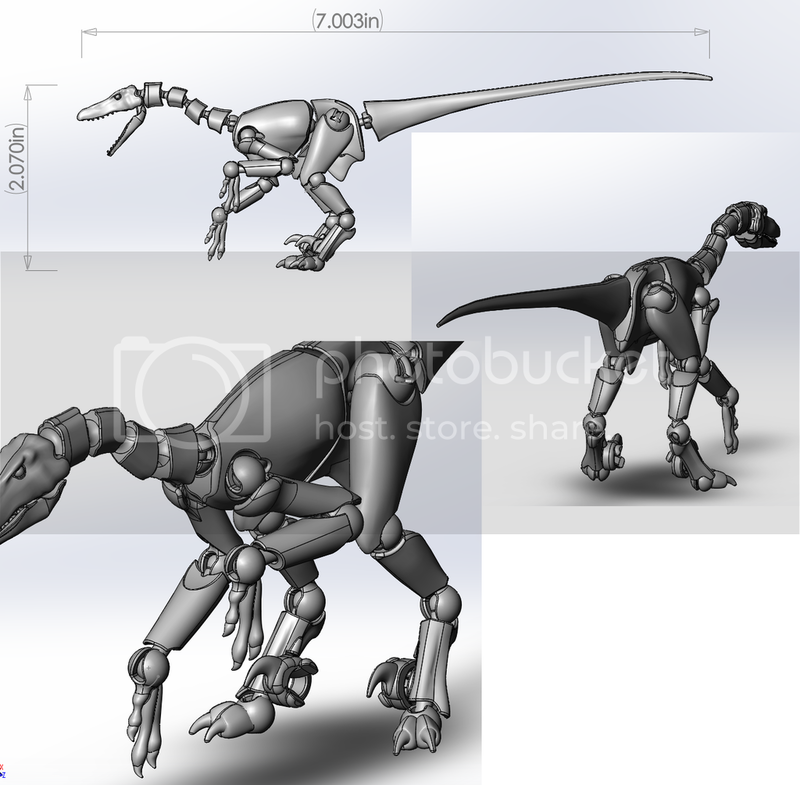 Like the Allosaurus, this'll be 1:12 scale with the head here a bit over 3in. (contains 'muscles' of the neck behind the fenestra). 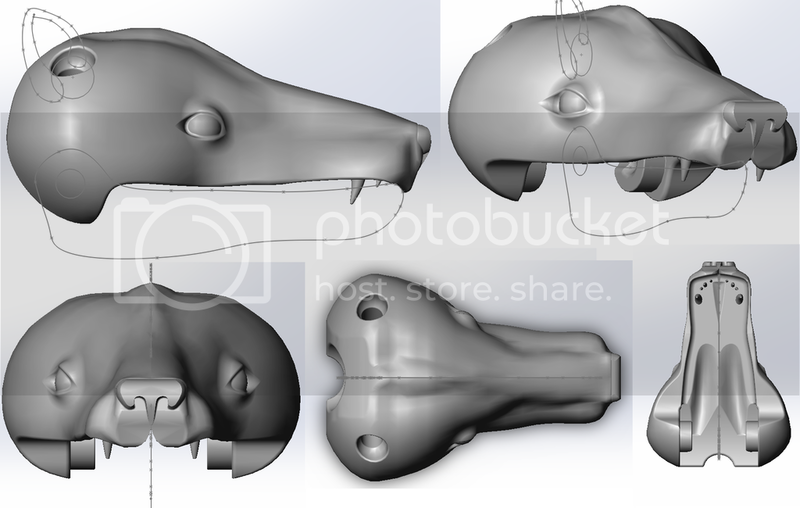 I might make two models for this and the body: one based on the old mesonychid interpretation (because it'll always have a place in my heart) and a stocky enteledontid body with a wider set of nostrils entelodonts often are depicted with. "On this island, there is no such thing as safe!" Look's nice! Definitely something I can't do. Great job. Update on the Allosaurus model! Despite my thoughts on what Andrewsarchus "should" look like, I love every iteration of it. I'd be really excited to see this as a real-world figure. Thanks! Working on the lower jaw now, and I've since given Andy a complete set of bone-crunching teeth for the upper jaw based on images I scrounged up of the holotype and copies. Only part I'm confused on are the molars. Were they cusped or just blunted dome-like surfaces? The pictures I've looked at are kinda confusing. Finally got back to doing some work on the project I first set out to do! 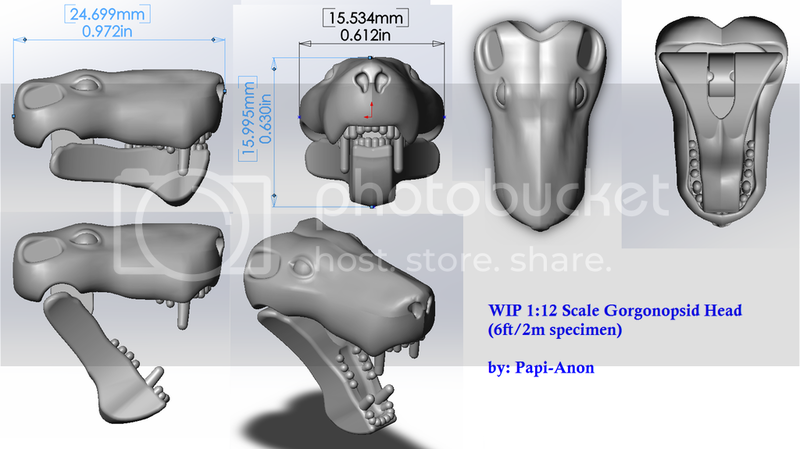 So here's Gorgonops (or just a Gorgonopsid) so far in CAD form. Lower jaw needs to be redone to the modified dimensions to it's less geometric-looking. 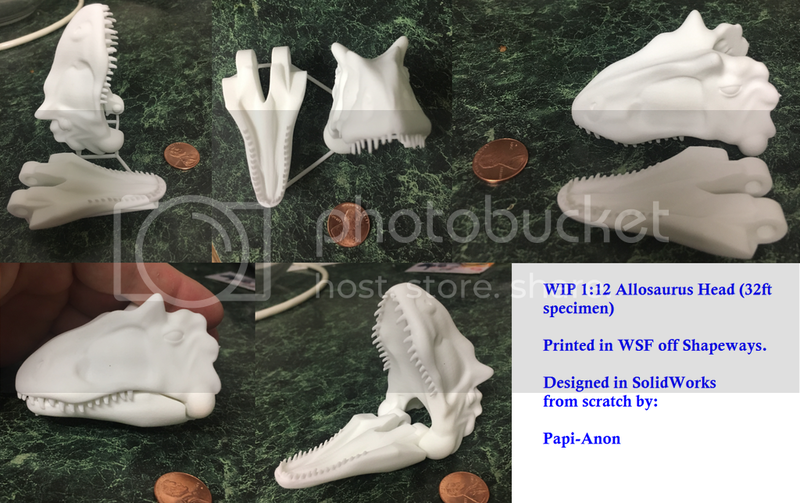 I've been able to print the teeth in the upper jaw in WSF and Elasto-Plastic on Shapeways, so I know those tiny teeth will still work for both jaw sets. 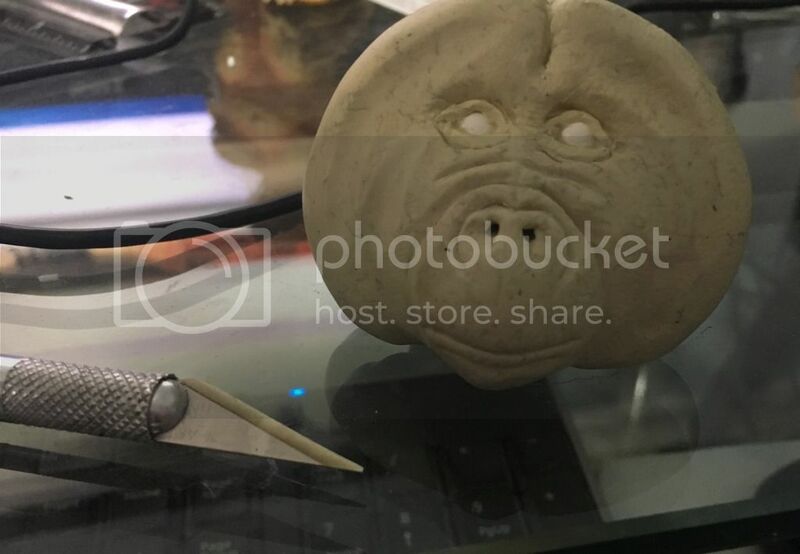 So been sculpting with plasticine clay over a baked polymer clay copy of the Gigantopithecus skull I made in epoxy, and went for a dominant male orangutan look for Giganto's head. Still needs skin wrinkles added to the right-side of the face, ears, and texture for the head's hair. I also gave the face a wrinkled, gorilla-like snout mixed with the jutting, roundish mouth of an orangutan since Giganto was basically an enormous oranguatan built like a gorilla. Hard to see the faint skin texture on the left side, but it's a bunch of random fingernail-tappings stippling the face. So the sculpt shown in the image has an actual skull underneath? That's dedication,... do you intend to use it as some sort of cut-away model? However, it looks very good, I like the combined morphology resulting in a form in between beast and something more humanoid. Yeah, I wanted to get a feel for head-shape based on the skull by trying to copy both gorilla and orangutan musculature before adding the flared cheeks. The skull I sculped was based on a proposed Gigantopithecus skull that can be bought online for a pretty penyny (said replica's lower jaw is a replica of the real thing with the rest of the mandibles added to the sculpt) but gave the face a mix of gorilla and orangutan jaw-shape. My epoxy skull original is still a WIP since the teeth are a pain in the rear to sculpt at 1:12 scale. This will be used to make an epoxy casting using silicone putty from craft stores (I have yet to get into liquid resins and silicone) for the mold. The body is still a WIP using a Marvel Legends Age of Ultron Hulk for the torso with added mass for the belly and pectorals. I'm considering just buying a Marvel Select Hulk instead and use that for the body instead.